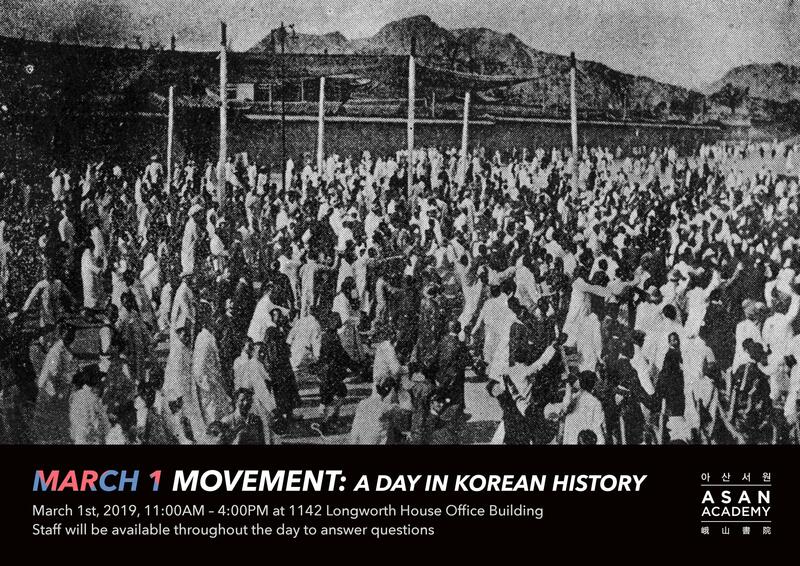 This March, a special photo exhibition was held at the Capitol Longworth House Office Building to commemorate the 100th anniversary of the March 1st Movement. The exhibition was crowded; about 50 people who visited were deeply impressed with the meaning of the movement and the historical pictures on display. The holiday marks the day when the Korean people stood up to defend their nation against Japanese colonization. The strong desire for freedom sowed the seeds for the modern Korean government. The March 1 Movement, also called the Samil Movement, inspired other non-violent protests around the world, and is regarded as one of the foremost celebrations of the year. The message of the exhibit was only positive, with no criticism of any other nationalities, despite the painful history on display. The Asan Fellows are students specially selected by the Asan Academy to cultivate worldwide leadership. The Asan Academy — a partnered initiative between the Asan Institute for Policy Studies and the Asan Nanum Foundation — aims to foster the next generation of Korean leaders. Each year, sixty individuals are selected as Asan Young Fellows to participate in a ten-month-long program of rigorous training and overseas internship. Currently, the 14th Asan Academy young fellows are dispatched in various think tanks and governmental organizations in Washington DC. Asan fellows held the March 1 Movement photo exhibition for various reasons. Soyeon Lee, who is studying Journalism and Communication at Kyunghee University stressed the importance of historical awareness. She said Korea is renowned for its rapid economic development, the so-called ‘miracle of Han river’. However, much is unknown about the country's dark history of Japanese colonization and the civil war that followed. Many people do not know how Korea rebelled against Japan at that time and how it affected the country’s current democracy. Soyeon sincerely hopes that more people will become interested in the independence history of the Republic of Korea. Taerim Ryu, a recent graduate of Kyunghee University who previously worked in The Embassy of Korea in Belgrade, Ministry of Unification Korea, CIVICUS UN Geneva Office, planned this exhibition out of patriotism. He had several key goals for holding this exhibition in congress. First, to notify members of congress about how Korea achieved independence. Second, to provide information to overseas Korean people or people with Korean heritage about their history. Finally, Taerim specifically wanted to commemorate the 100th anniversary of the March 1 Movement in Washington DC — often considered the center of the diplomatic world. On behalf of South Korea, Asan fellows feel proud of representing their ancestors’ spirt and desire for independence. After finishing this exhibition, they will continue to plan other events and carry out projects to spread their values and consciences. Seol Hong is an ASAN Academy Fellow and a participant in the East-West Center in Washington’s Young Professionals Program. She is a graduate of Korea National University of Arts concentrating in Musicology and minoring in Arts Management.